In the following scenario, we will describe one method of calculating the relevant information, and determining the mounding of groundwater using example field/lab data, and some of the calculators available from GroundwaterSoftware.com. A property owner is aware of a contaminant plume located in the vadose zone under a 30 m by 45 m grassy area of his site. Natural attenuation keeps the plume located at approximately 9 meters above a known aquitard. They have two monitoring wells, 45 meters apart, with the contamination slightly offset in between them (30 meters from the upgradient well, and 15 meters from the downgradient well). They have pumps installed in the wells so that under significant rainfall events, water can be pumped to prevent the water table from reaching the contamination and allowing it to migrate further. They would like to know if the groundwater is expected to mound up to the plume at a percolation rate of 7 x 10-7 m/s over two days. The water table is located 8 meters above the aquitard in the upgradient well, and 6 meters above the aquitard in the downgradient well. Analysis of soil samples yielded an average porosity of 0.25, and a d10 value of 0.13 mm. The specific yield of the aquifer is estimated as 0.01 m, and the average groundwater temperature is considered to be approximately 10 degrees Celcius. Therefore, this percolation rate would not cause the water table to reach the contamination area. There are several commercial programs that are also able to calculate groundwater mounding, including MODFLOW and Groundwater Vistas. Batu, V. (1998). Aquifer Hydraulics; A Comprehensive Guide to Hydrogeologic Data Analysis. Published by John Wiley & Sons, Inc. New York, NY. Bear, J. (1972). Dynamics of Fluids in Porous Media. Published by American Elsevier. New York, NY. The Model 410 Peristaltic Pump is designed for vacuum pumping or pressure delivery of liquids or gases. It is ideal for sample removal from shallow wells and surface water. The mechanical peristaltic operation is effective to depths of 28 ft. (8.5m) at sea level, being limited only by the suction lift limit. The Peristaltic Pump has a variable pumping rate and can deliver from 10 ml/min. in sample mode and as much as 3 liters/min. in the purge mode. 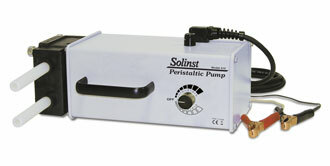 These are only some of the new and improved features of the Solinst Peristaltic Pump. See the information page for more details.